CareerEdge hosted a Workforce Forum to better understand the workforce need in St. Petersburg Florida in 2017. The event was attended by 30+ community agencies and consisted of conversations and strategy sessions to better assist the local workforce and decrease duplication of efforts in the community by working more closely together as organizations. 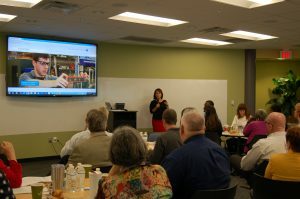 The Collaborative Labs at St.Petersburg Community College recorded a “real-time” record of the discussions, plans and goals that came out of the meeting. View the real-time record here.